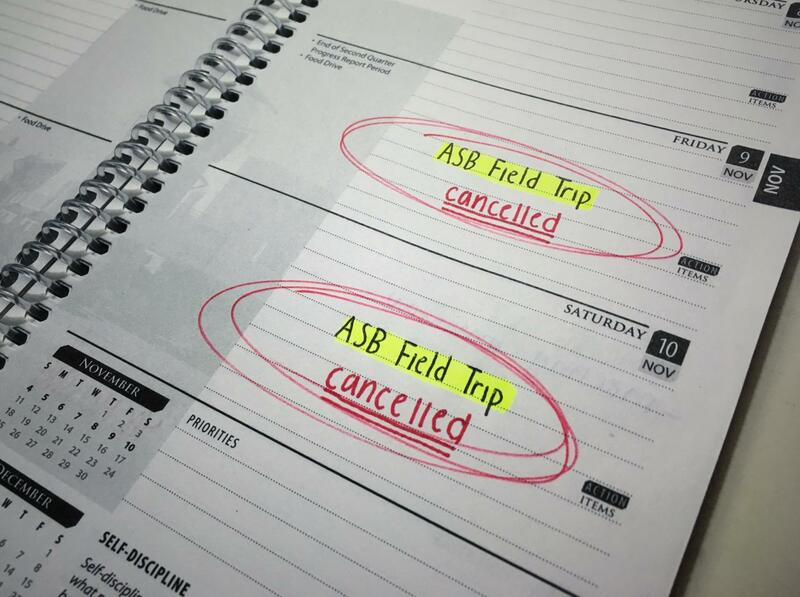 The ASB field trip is crossed out of student planners now that it has been postponed. ASB students were anticipating their annual field trip in the wild, but because of unhealthy circumstances, it was delayed. The trip was supposed to take place at the YMCA Camp Jones Gulch in La Honda, California. The ASB Service Council was expected to leave at 11 a.m. on Friday, Nov. 9, and the ASB Activities Council was expected to leave at the same time on Saturday, Nov. 10. However, due to the recent fires in Northern California, La Honda was one of the cities that were greatly affected by the smoke. “We were using the air quality index (AQI) and determined that it was above 150 and that it was unhealthy. The administration said that we could go on the trip because the forecast was showing that [the AQI] was going to get back into a healthy range. But if it didn’t get into that range, we would have to be able to [take shelter indoors], and we didn’t have any indoor space available [at the camp] until 5 p.m.,” said Jim Kelly, the ASB advisor. Throughout the week leading up to the trip, Kelly taught leadership-based lessons in class. One of the many lessons that had been taught that week was the concept of improvisation. “Well, this [field trip] is a different one for me because I’m trying to teach leadership from an improvisation standpoint. That’s certainly not in my comfort zone and improvisation is not in my field of expertise, so there is that challenge and also that adventure that I’m going on,” Kelly said. These different lessons tie into the meaning of the trip as a whole. “The idea is that at the field trip, we will do the same types of problem solvers [activities done in class] at the camp but in a more beautiful setting,” Kelly said. However, once the trip was rescheduled, improvisation was almost necessary. The delay of the trip brought a variety of responses from the ASB students. Many were upset that the field trip was postponed. “I think it’s [sad] because it was an event that we planned for a while. I went last year, so I understand the values of it, as it brings this group together. It’s much more intimate than other team-bonding activities. Having it canceled, it’s like a step back. But I understand why they did it though. Student safety is more important, but it is still [a disappointment],” said Jackson Tam, a junior in ASB. The unexpected wait was also seen as disappointing for first-timers. “I’m kind of upset about it because this [was] my first ASB field trip. I was really looking forward to going because I love ASB, the people in it, and Jones Gulch [the camp]. It was a little disappointing that we can’t go, but it’s out of our control,” said Tim Krassiev, a senior in ASB. Contrarily, a handful of students had a positive attitude on the situation. “Honestly, I already know that we’re going to be able to bond in other ways besides the field trip. Sure, it is a big hit, but I’m not that affected by it,” said Jono Sison, a freshman in ASB. Another student shared a similar point of view. Although it was devastating for many that the trip was canceled that weekend, it opened up a lot of free time for students. “It was a really relaxing weekend. I did find other things to do, like hanging out with my friends. I felt like overall, it was rejuvenating,” said Naya Salah, a sophomore in ASB. The field trip is now expected to happen in January. Despite the fact that there were different perspectives on the dilemma, one feeling all students shared was excitement for the field trip in the second semester. This story was originally published on Scot Scoop News on November 19, 2018.